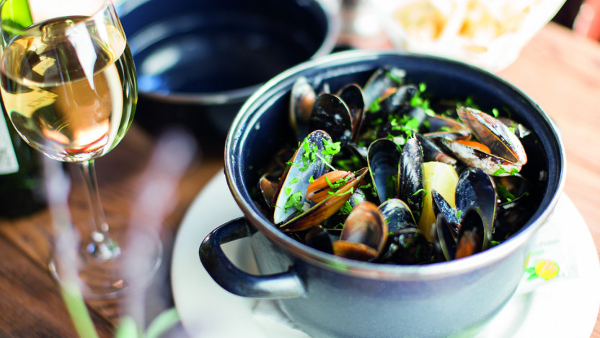 Rope-grown mussels steamed with onions, parsley, white wine and a splash of cream. This simple, but tasteful French dish, has a great combination of flavours and is sure to impress any guest. Our quick and easy recipe makes it the perfect dish for any dinner party, or gathering of friends. 1. Chop the onions and parsley. 2. Cut the lemon into wedges and remove pips. 3. Sort through mussels, discard the ones that are open, or any that are damaged (they have perished and are not safe to eat). 1. Clean mussels and place in heavy based pot. 2. Add onions, butter, bay leaves, thyme and white wine. 3. Cover with lid and steam on stove for 1 to 2 minutes until all the mussels are open. 4. Add cream and lemon. 6. Sprinkle with chopped parsley and serve in hot bowls. 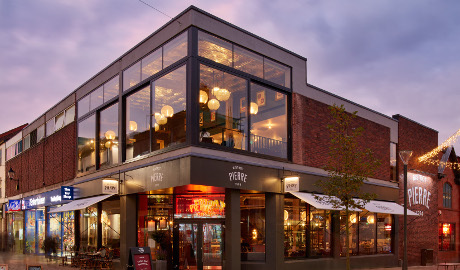 Le Bistrot Pierre's 17th bistrot is located in Altrincham's Stamford Quarter, contributing to the revival of the town centre which is benefiting from major regeneration and a growing food and drink scene. The two-floor restaurant, with space for 170 diners has impressive floor to ceiling windows, stunning French-styled interiors, a bar area and outside seating. Our raison d'etre is great value French cooking and seasonal menus. 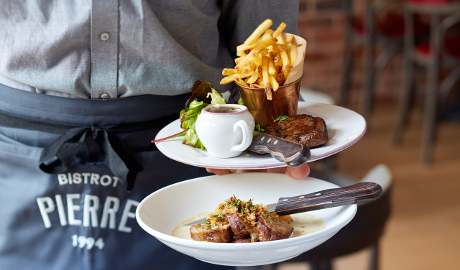 We like to combine French bistrot classics such as steak-frites, boeuf bourguignon and creme brulee with our own take on regional favourites like confit de canard and pate de campagne. 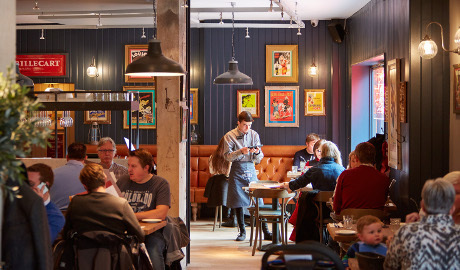 Our relaxed and friendly bistrot is the place to go for any occasion. Open seven days a week, we serve lunch and dinner daily and breakfast at weekends. We have something for everyone, from our two-course prix-fixe lunch for 'Â£11.95 and a two-course pre-theatre menu for 'Â£14.95 to our evening a la carte menu. We also offer gluten-free dishes and a children's menu, which comes with our bespoke 14 page activity pack.